The skyrocketing bitcoin price in 2017 transformed cryptocurrency from a word few people had ever heard to the hottest thing in financial markets. Investors flocked toward the digital currency, and precious metal dealers created unique silver round collections to give people a tangible piece of the worlds most popular anonymous currency. The 1 oz Antique Bitcoin Anonymous Owl Silver Round is now available to you for purchase online from JM Bullion. Arrives inside of protective plastic and includes a Certificate of Authenticity! A 2nd release of Bitcoin designs from Anonymous Mint! Bitcoins now-iconic symbol appears on the obverse. 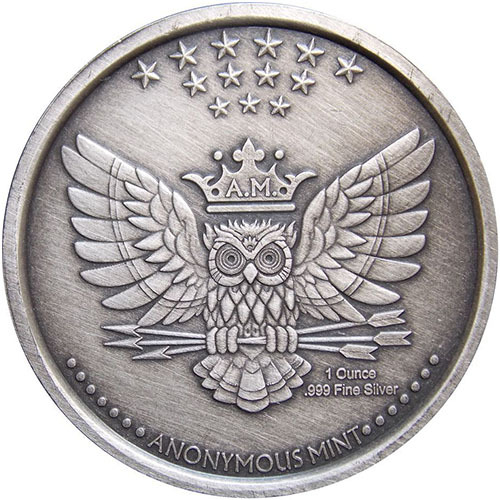 Anonymous Mints owl logo is featured on the reverse. Series from Julie Lindquist at Anonymous Mint. Antique silver rounds are unique products that appeal to collectors in particular. The application of an antique polish to a modern silver round gives a brand-new product the visual appearance of ancient coinage. On top of that, antiquing a silver round helps to highlight the finer points of the design elements on the round. The 1 oz Antique Bitcoin Anonymous Owl Silver Round marks the second Bitcoin-themed release from the mint. The previous Bitcoin Guardian Rounds were met with intense demand, and the combination of Bitcoins anonymous nature and the Anonymous Mint as the design partner is the perfect match. On the obverse of the Bitcoin Anonymous Owl Silver Round is the accepted symbol of Bitcoin. This capital B is struck through vertically with two lines and has a background field design that incorporates computer code. Bitcoin is an all-digital currency held online in virtual wallets. These 1 oz Antique Bitcoin Anonymous Owl Silver Rounds are the closest people will ever come to holding a physical representation of the famous cryptocurrency. The reverse side of all 1 oz Antique Bitcoin Anonymous Owl Silver Rounds shares the same design feature used on the copper and 1 oz proof rounds in the release. The owl is the logo of Anonymous Mint, chosen for its representation of anonymity and wisdom. The owl featured here mimics the appearance of the US heraldic eagle, with wide wings and arrows in one talon. There is also a grouping of 13 stars above its head. All 1 oz Antique Bitcoin Anonymous Owl Silver Rounds ship to you in protective plastic to ensure quality and feature a numbered Certificate of Authenticity. Each individual round has a unique serial number engraved on its rim and that match number is found on the accompanying COA you receive with purchase. JM Bullion is proud to serve as the exclusive release partner on the Bitcoin Anonymous Owl Round! We encourage JM Bullion customers to contact us with questions. You can call our customer service team at 800-276-6508, chat with us live online, or email us directly with your inquiries.
" Absolutely beautiful round! This is my favorite of any Bitcoin variation I\'ve seen. It is produced by a spectacular mint that seems to put great attention to detail into their products." "Absolutely beautiful round! This is my favorite of any Bitcoin variation I\'ve seen. It is produced by a spectacular mint that seems to put great attention to detail into their products."